Sisätilojen talon koostuu kerroksessa tilava olohuone merinäköalalla, keittiö ja kylpyhuone ja makuuhuone; Yläkerrassa 4 makuuhuonetta, kylpyhuone, jossa kylpyamme, pieni kaappi, parvekkeet ja terassi. Ulkopuolella, ylävirran puolella on mahdollisuus parkkipaikka, tiili grilli, hedelmäpuita; Meren puolella, iso terassi merinäköalalla ja suora pääsy merelle yksityisen portti. Talossa on myös polkupyörän ja ammatillinen kanootti. 20% alennus hakea vuokratulot touko-kesäkuussa !! Huvilassa on kaksi kylpyhuonetta, yksi pohjakerroksessa suihku, toinen ensimmäisessä kerroksessa, jossa on kylpyamme. On myös ulkosuihku portaat rantaan johtavan. Wij hebben met z´n 10-en een hele mooie vakantie gehad. Na een heel gastvrije ontvangst, hebben we genoten van het huis, de zee en het dorp met restaurantjes en winkeltjes op loopafstand. Herrlicher Urlaub direkt am Strand! Die Urlaubstage waren für uns als Familie mit erwachsenen Kindern wunderbar. Die Lage und die Größe der Unterkunft waren für uns zu fünft ideal. Auch für ein oder zwei Personen mehr wäre die Unterkunft immer noch groß genug. Wir haben einfache Essen in der Küche selbst gekocht und für die komplizierten Essen sind wir in ein fußläufiges Restaurant gegangen. Jeden Morgen hat der Bäcker geklingelt und frisches Brot und Brötchen angeboten. Zum Baden im Meer brauchten wir nur die Strandtür öffnen und wir waren direkt an der Badestelle. We spent 12 nights at this property and we loved it. It is great value for money. The house has everything you need. It is very generously equipped with lots of crockery, cutlery, tea towels, sheets, towels, big dining table, outdoor chairs etc. The BBQ was well used by us. The owner is very responsive to communication and was always prompt in their replies. 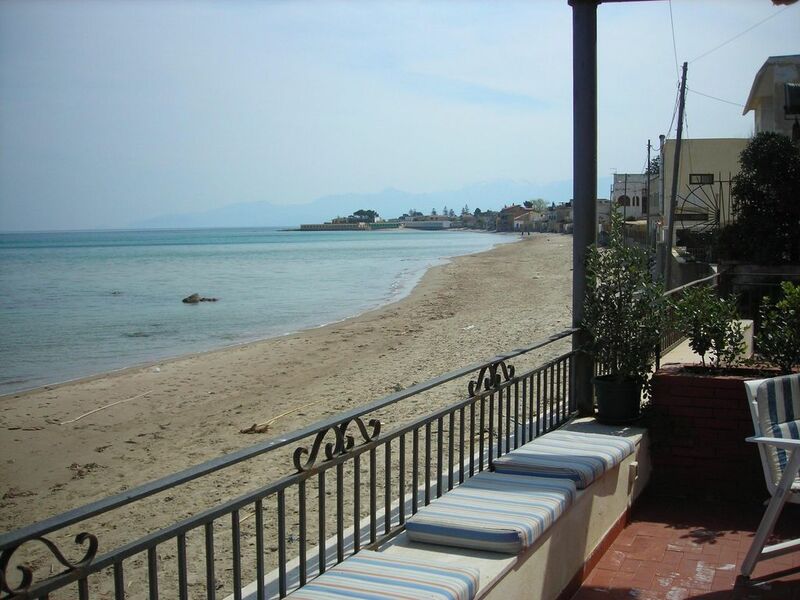 The house is very comfortable and though not luxurious, it reflects the price and the photos:) The location is amazing, a short walk to everything you need in the local village and has beach frontage. They provide a couple of old bikes which is also very useful to do some quick groceries. The deck was our beach front and we felt so lucky to be eating our meals and relaxing whilst overlooking the beach and sitting on deck chairs under our shady umbrellas. There is a private outdoor shower to rinse off after a swim. Unfortunately, the pictures no longer reflect the beach as apparently there was storm in the last few months and now the sandy beach is washed away. Now you have to cross some rocks to get into the water. There is sometimes some seaweed to navigate but this was no problem, the water was beautiful. The lack of beach in many ways worked to our advantage as the sandy beaches further up were filled with beachgoers and we had nobody using our beach frontage, so we felt it was our personal pool in front of us! The marina which is a short walk had an amazing seafood restaurant which looks like it pops up over summer with plastic tables and chairs and the marina was buzzing at night with stalls and entertainment. A couple of disadvantages...because we were their over summer it was very hot and mosquitoes are a problem at night when you leave the doors open (though this a problem all over Italy we find). Fans (there is one) would have been nice in the bedrooms, but they may have overloaded the power. The electricity would sometimes overload. However the the owners has shown us how to reset the power. This is expected in an old house and like I said, this is reflected in the price. We would definitely stay there again. Thank you Corrado and your lovely mum and dad. The beautiful location and the general athmosphere of the house make it a superb place for the family vacation. We didn't plan to have car in the vacation, so we have looked for the place not far from public transport. As we have booked the place, the address which we've got was quite far away from the village center, but as we came to the place it happened to be just 10 min. walk from the village center, where you will find everything you need. The family of Carrado is very amicable and helpful. They have met us on the railway station of the village and showed everything we needed in the area. There are lots of activities in the place and you will have no time to get bored, even if the weather is not quite nice. I would recommed the place for the families with kids, since my kids loved to be there. Wish to come again to Sicily. The house had everything you need and much more. The views are amazing and the terrace a dream. We had a great holiday with our children and friends. we love to come back. Villa sijaitsee rannalla San Nicola L'Arena, sijaitsee vain 5 minuutin kävelymatkan päässä kylästä, josta löydät palveluja, kuten supermarketit, apteekit, leipomot, rautatieasema, pankki, lääketieteen, baareja, ravintoloita, tankkaus , tupakkakaupat, tuoreet kalamarkkinat (kalastajien itsensä myymät) ja varusteltu matkailualue. Huvilan sijainti mahdollistaa päiväretkiä Sisilian tärkeimpiin turistikohteisiin, vain 20 km: n päässä Palermosta ja Monrealesta, ja 25 km: n päässä Cefalùsta, vain muutaman minuutin päässä Imeran ja Solunnon arkeologisista kohteista. I prezzi si intendono per un minimo di 5 giorni, sulla base di 6 persone. I prezzi sono comprensivi di consumi, biancheria e pulizia finale. Si richiede caparra per la prenotazione del 30%, il saldo in loco alla consegna delle chiavi. Si richiede deposito cauzionale di 200 €. I prezzi si riferiscono a soggiorni settimanali e variano in base al numero di persone e al periodo.